Join with the Thrive! Endeavor® and together help create and empower a vast, sustained human endeavor building and sustaining thriving and surviving future for all forever. Contact Thrive! You can join Endeavor by helping build a thriving future. Start by building a better future with your family and friends. Or start with your community. Or start with your country. Start with who and what you care about and move from vulnerable to surviving to thriving. Book Thrive! - People's Guide can help you succeed. Available Amazon.com or free download. The Thrive! Center, home of Thrive! 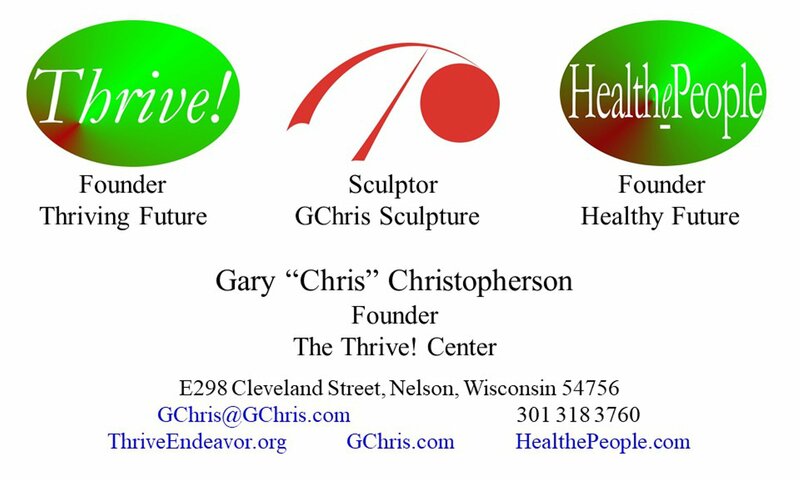 Endeavor, HealthePeople and GChris Sculpture, is on Mississippi River bluffside in restored 1885 farmhouse and barn above Village of Nelson (WI). Surrounded by Thrive! Park, 25+ acre bluffside, public park donated by Chris. Thrive! Discuss and strategize our future. Extinction? Just surviving? Thriving? All thrive? Join Thrive! Endeavor? HealthePeople. Discuss and strategize achieving healthy people. Best personal, community or country health system? Thrive! Sculpture by GChris. Tour Studio/Gallery. Interact with 200+ sculpture. Payments to Thrive! Scholarship. Thrive! Park. See great views of Mississippi River and Lake Pepin. Walk/hike bluff side/top roads and trails. Historic 1885 Era Bluffside Farm. Tour renovated/restored house, barn and beehouse. Views of Mississippi River. The Thrive! Endeavor® (TE!) helps by motivating governments, private sector organizations and people of all backgrounds and generations to work together to build and sustain a thriving future. "Children Thrive Forever" is boldest of visions for you, all children and all of our future. Children, it is your future, the one we all want and need. It is your future, one we together can achieve. When all children thrive, you thrive! Family/friends thrive! Community and Country thrive! World thrives! 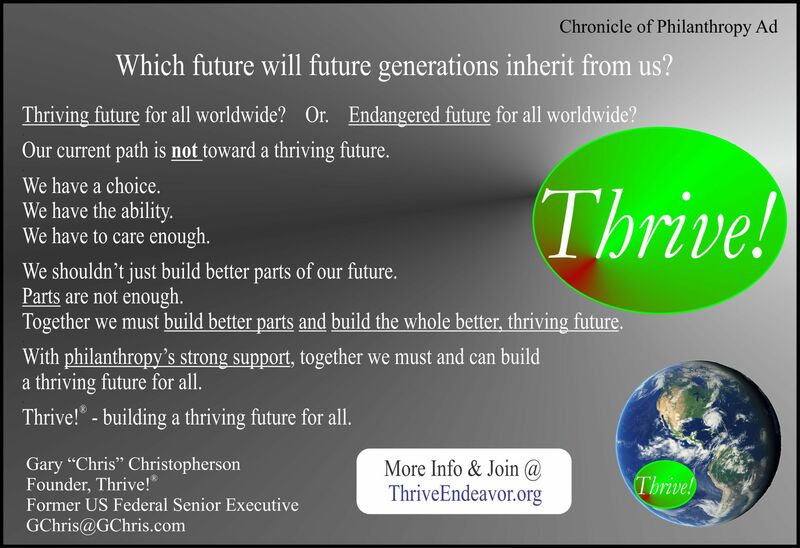 ThriveBlog.org - Policy/strategies to achieve thriving future. Thrive Books - Available via Amazon.com or as free downloads below. Thrive! Endeavor® - All Thrive Forever. 2015. Paperback & eBook. Thrive!® -Quick Guide To A Thriving Future [For All Forever]. 2013 & 2019. Paperback & eBook. Thrive!® - People’s Guide To A Thriving Future [For All Forever]. 2013 & 2019. Paperback & eBook. Thrive!® - Building a Thriving Future for All. 2011 & 2019. Paperback & eBook. The Thrive!® Philosophy - All Thrive Forever. 2015. Paperback & eBook. Behavior Effectiveness Model (BEM). Thriving Future Using BEM. 2015. Paperback & eBook. Thrive! Sculpture & Thought. Sculptural Vision of All Thrive. 2016 & 2019. Paperback & eBook. Thrive!® - All Thrive Forever®. What will you do?® The Game. 2015. Paperback& eBook. The Thrive! Endeavor, you and all of us together, build a thriving future. To have this future, we need to have it for you and everybody’s family and friends and every community and every country and every part of and our entire world. When all this comes together, you and all of us will have built, achieved and sustained this future. We bring all this together with the Endeavor where you and all of us together, build, achieve and sustain this future. Only all of us together can succeed due to scope (all), level (surviving and thriving), duration (forever) of the challenge. Endeavor is all of us together building, achieving and sustaining that future. “All of us together” include individual people, groups of people, private sector organizations and governments. “All of us together”is current and future generations. “All of us together” is you, and everybody’s family and friends, and every community, and every country, and every part of and our world. Each and all of us should develop and take as many positive actions as we can. The more positive actions taken, the better for all of us. Each and all of us should help build, achieve and sustain this future for our family and friends. For our community. For our country. For our world, including the Earth on which we depend. Via these actions and the Endeavor, each and all of us together should build, achieve and sustain this future. What a thriving future will be. This Guide describes what your life and your world will be in a thriving future where all survive and thrive forever, to the maximum extent possible. This future is Thrive! and is a bold vision and mission. For you and your family and friends, this future is a better life now and for the near and long term future for all of you and for future generations. For you and your community, this future is a better life now and for the near and long term future for the whole community and for all of the community’s people. For you and your country, this future is a better life now and for the near and long term future for the whole country and for all of the country’s people. For our world, this future is a better life now and for the near and long term future for the whole world (people and Earth) and for all of the world’s people and the Earth itself. For you and all that you and we care about, it is a much better life and future with less vulnerability, with surviving and with sustained thriving. When this future is achieved, you, families and friends, communities, states, countries and the world will be: Performing well, Well-off (financially), Well nourished, Well housed, Well protected (exposures, crime), Well educated, Physically and mentally well (people), Growing/developing well, Living within good habitat, Physically well (Earth, plants, animals, environment), Not vulnerable, Producing personal and public goods, Living within a stable, positive climate, and Sustained. Thrive!, a thriving future, is different and arguably better than anything tried or achieved in human history. Not just getting by or achieving a surviving future. A surviving future is necessary but not sufficient. It is this future for all people and all future generations, a "50+ generation" strategy. Not just for some people or just for the current and next generation. It is this future forever, a 1000+ year strategy. Not just for today or just 100 years. It is also for Earth on which we live and depend, not just for people. Vision: All thrive forever. All includes you, your communities, and our world. Mission: Create large, positive, timely change that achieves surviving and thriving future for all forever. Strategy: A joint Thrive! 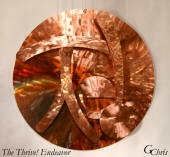 Endeavor and call to action builds a thriving future for all forever.